Most climbs are famous for racing but there are few exceptions where a mountain is better known as a training location. You might think of Mont Teide or the Col de la Madone, here is one of Italy’s asphalt gymnasiums, a timed segment decades before Strava arrived. If it’s famous as testing ground for pro cyclists, the reality on a Sunday morning is that it’s one of the most popular cycling routes in Italy with cyclists of all shapes and sizes tackling its slopes. 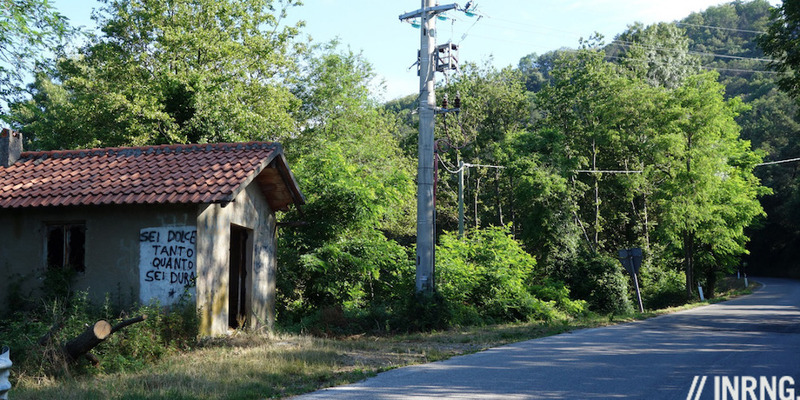 The Route: there are several roads to the top of Monte Serra but this will focus on the climb from the town of Buti which sits to the east of Monte Serra, part of the Monte Pisano range in Tuscany, central Italy. 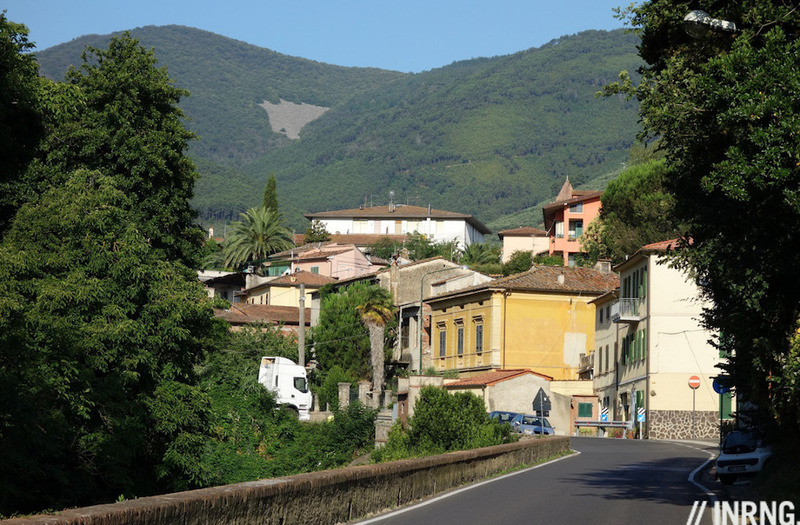 The road climbs through Buti, as you approach the centre there are signs for Monte Serra to the right… but carry straight on to the centro as it’s more scenic to ride through the town square. Leaving the square the road rises alongside a small river and in less than 500 metres arrives at a junction. Here turn left and the road rears up, this is the proper start of the climb, more of which later. From here it’s uphill for until the road reaches a junction 7.5km later next to a restaurant. At this point you can turn right to continue climbing and scale the mountain in full, or turn left to descend towards Calci. Turn right and there’s a small fountain further on for water. Keep going and you can also ride up to the large aerials at the top but fences surrounding the masts block you and the view. The Feel: in three words: Tuscany gets Copenhagenized. On a Sunday morning there are so many riders a first time visitor might imagine there’s a gran fondo passing through. The climb has an association with pro cycling but on a normal day this is an accessible climb in a region of Italy where cycling is popular. Everyone rides up from racers to silver foxes on team issue bikes to locals in t-shirts and replica football kit. The road is rough a few places, especially when you leave town past the houses and again passing the Santuario della Madonna della Neve but it’s uphill and you have time to pick your line around this and generally most of the surface is fine. It’s not a level climb, the gradient varies in places although generally each section between each bend is a level ramp. The higher you go the better the views get, the chestnut and pine woodland often opens up to reveal the landscape below. This is not a great climb for its challenge, it’s neither long nor steep and even the views aren’t great because you’re often in woodland. But that’s the whole point, it’s an accessible mountain in the middle of a cycling hotbed, a magnet for riders in the region from pros to locals. It’s got something for everyone, whether a timed challenge or simply a mountain to scale for the views. The Local View: Rachel Neylan is a local, well at least an expat Australian living nearby. A silver medallist in the 2012 Worlds in Valkenberg, she’s on the Australian team and raced La Course and the Commonwealth Games recently. And she’s just ridden up Monte Serra too. What makes it so useful for training? 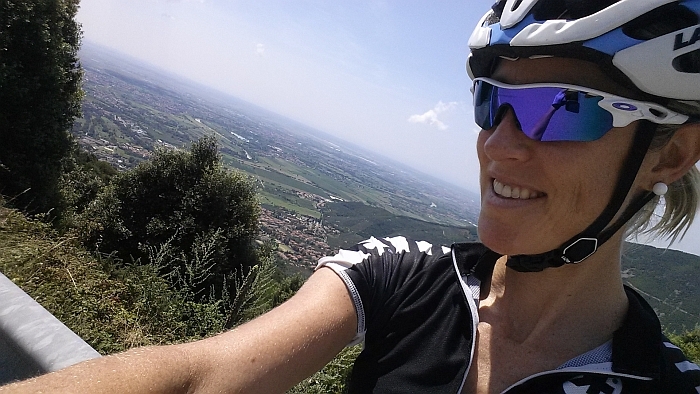 The proximity to Lucca is convenient when you want a flat warm up of 45 min or so. It is a long climb where you can do nice endurance and strength work, has three sides for variety, different gradients and of course brilliant views. It is an iconic climb in the area visible to get bearings from anywhere. It has a great pro cycling history as one climb many pros have used for years to make their 20min max power tests. Do you have a preferred route up and down? No I like to mix it up a little. I believe is never a good thing to key the body get too conditioned to things. But it is the most popular as it’s a more steady gradient. However if it’s winter/spring Calci side is warmer and less shady as it faces the sea. In summer San Andrea has more shade. Any tips for a fast time up? Don’t go too hard too early as it’s steeper. Get into a good rhythm and maintain it. Big ring through the middle of Calci and towards the top of the Buti side. Don’t think about the pain, embrace it! Yes but I work with an SRM powermeter and always focus on power output and the goal of my training session first and foremost. 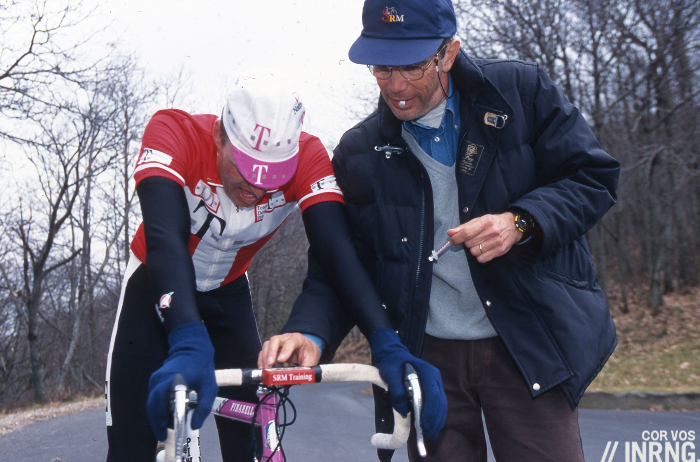 Time Yourself: long before internet this was a climb where riders compared times. If you want to time yourself, the start point is the bridge with green railings just before the road rears up on the edge of Buti. The stop point is 6.1km later on a tight left-bending hairpin bend, with the exact finish just before the apex of the bend as shown above, there’s often tape or chalk on the road. See it on Strava. In order to get a fast time be sure to attack the hairpin bends and use the drops on the faster sections, there’s one portion with a reduced gradient. 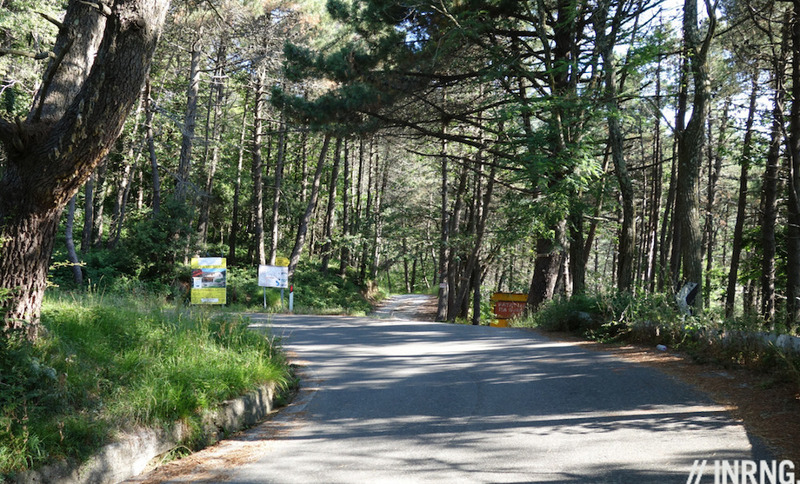 “Private gymnasium”: Monte Serra has long been a useful climb to test the legs and from the late 1980s onwards sport science advances saw special interest in timed uphill efforts. With no drafting effects and the constant load from the gradient, a climb is an outdoor version of a lab test and perhaps superior given the rider is on their own bike in a natural environment. It’s on these slopes that the science and practice of W/kg, VAM and other jargon emerged. As Daniel Friebe tells in “Mountain Higher“, Italian coach Luigi Cecchini lives near the climb and for years it was his testing ground, both for himself and his clients. Cecchini’s reputation is ambiguous, a coach of many “dirty” riders but never directly linked to scandal. That’s him and Bjarne Riis in the picture above and it seems to be right on the Serra “finish line”. The internet says Ivan Basso holds the best time with 16.10 but Friebe mentions Jan Ullrich and 15.40. Such times can pollute the climb and no Court of Arbitration will ever amend them. Yet it cannot be stressed enough that these negative associations are not the reality. The pros who train diligently, the hundreds of cyclists who ride up, the hikers and mountain bikers as well as the people who just drive up for the view are each getting their piece of the mountain, this is a popular place open to everyone. “It’s sweet when it’s hard” – graffiti on Monte Serra. About hill reps? Travel and access: this is near one of Europe’s tourist hotspots but few visitors to Florence and Pisa will climb the mountain. All the better for you as it means easy access but no crowds. Pisa airport is near, Florence is well served by rail plus the autostrada network. Is that a syringe in the hand of the trainer in the penultimate photo?? Blood sampling for lactic acid possibly?? Yes, presumably for blood lactate but I wonder if we’d see a pic like that today with out the internet exploding. Yet this photo has existed for years (taken in 1995?). How long did Bjarne deny taking EPO? Syringe + Cecchini = ??? Nice to see the pieces about roads outside of the major races, shows that there is more to cycling than just the obvious climbs. Btw, tips for a fast time says ‘gard’ instead of ‘hard’. In the Varese region, where cycling is almost as popular as around Lucca, there are a number of such climbs, used by Pros (Basso, Contador, Chiappucci) and Amateurs alike. Few cars care to drive there. Some good ones… but they are climbs for riders in the north while Monte Serra is “The Climb” for those in a large area of Tuscany and even beyond. Obviously but the above mentioned – some more than others – play the same role in Varese. There are others like Serra in Tuscany. Although important, it’s not the one and only that is used a lot. Nice read. Your descriptive writing makes me also use my imagination and I would love to be in Italy to ride this road and the many roads less traveled (although this one is well traveled). I’ve never been to Europe and climbed the famous or the little-known roads that are scattered throughout the regions. It would be a dream come true for me to do that. Fortunately, there are countless places in this beautiful world where roads offer the willing the challenges and scenery together. I am fortunate to live in a rural county in California (Santa Cruz), where we have endless climbs on beautiful roads. The Santa Cruz Mountains offer both road cyclists and mountain bicyclists a “playground” that seems never-ending. I’ve ridden a large portion of this county, mostly on my road bike, but also single-track trail riding on the MTB when I was younger. What’s amazing is that there are so many roads where one might pass only two or three other cyclists if you go on the right day. And that’s the crème de la crème, the ability to find solitude on a perfect road. The Tour of California has ridden through our county the majority of its years as a race, offering some fantastic climbs and descents. I don’t have a video camera that mounts to the helmet (or bike or body part), but would love to see a website where cyclists post their personal videos of a good days ride. We who are fortunate to have seen the world from two wheels (man-powered) have experienced something that I treasure immensely. Thanks again for another road to put on the wish list! Nowadays you meet the waif like doctor Checcini on his bike, almost everyday, summer or winter, on the beautiful roads and scenic mountains around Versilia. ( Lido di Camaiore) He seldom talks about the history, but one day he showed me where another of his clients, Jan Ullrich, used to sneak away: a pasticceria on the foot of the mountains of Alpe Apuane. (The cafe still has a big signed photo on the wall of Ullrich.) I highly recommend this area for serious cycling and epic rides in beautiful surroundings. with plenty of challenging routes. I have never met so many incredibly strong riders around 40 – 60 years old anywhere in the world and to find a good groupetto for a tough, but friendly and safe, 4-6 hour ride is not difficult. You can also get your share of “star gazing”: Petacchi, Chicci and many other pros live and train around here and are often seen together chit chatting with local amateurs. I’ve done the side from Pieve di Compito, and there’s a decent stretch of steep long ramps joined by switchbacks. There’s a sign saying 20% (I thought – can’t find it back on Streetview), but I don’t believe it’s ever quite that bad. It does average 10% for nearly 2 kilometres though, with maybe a few hundred metres of ~12%. If you start from the Via di Tiglio / SS439 and go all to the way up to the radio masts, that’s 859 metres of ascent over 12.2 kilometres – 7% average. That’s a decent enough climb! Actually the writing in the walls translates in something like “as much sweet as hard”. One of the most famous cycling climbs. Love this series! I know this might be harder to do since you would have less / little first hand experience … but I just read the Cyclingnews article about Quintana training in the Boyacá mountains in Columbia. I would love to hear more about other geographic areas (South / North America)! In these non cycling hot beds are often hard to find good rides since most mountain passes are not paved and the Tour isn’t coming through to make it worth while. Anyways I would be very interested – or interested if you know of other sources that might have this kind of information. Bike touring is an interest of mine. I wish… tempted to visit Colombia first hand to see the climbs but I think it would need a month or even three to include getting used to the altitude, travelling around various places and more. For now all “roads to ride” are roads that have been ridden and usually several times which helps to get an impression. Was lucky enough to have gone up here today from Calci. The road surface is way better on that side but it’s definitely harder work in the full sun. Saw no other cyclists on it today (in August) other than a lone mountain biker. Great road, especially following the descent back towards Lucca.